Wads of dollar bills are usually as much a part of rap videos as fast cars, diamond-encrusted jewellery and scantily-clad models. 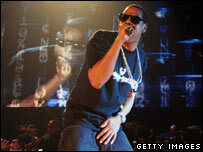 But in an apparent nod to the low value of the dollar, rapper Jay-Z's new video Blue Magic features another currency. It follows reports that the supermodel Gisele Bündchen also favours euros. The catwalk star's twin sister and manager Patricia told Bloomberg in September that: "Contracts starting now are more attractive in euros because we don't know what will happen to the dollar." The US currency has been ticking off historic lows over the past few months as falling US interest rates make other currencies more attractive. It recently passed $2.10 to the pound, reached parity with the Canadian dollar and set an all-time record of $1.4752 to the euro. Other more conventional market-watchers have also been snubbing the dollar, including the billionaire investor Warren Buffett. There have been no suggestions that Jay-Z's fellow rapper 50 Cent could be considering a move into a different currency.